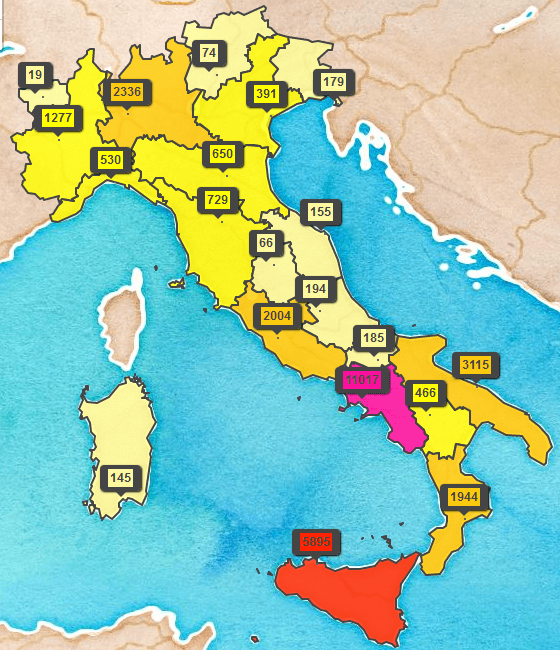 Discover the distribution of Italian last names with an interactive map: see how many families in Italy have that last name and where do they live. To view a last name's map simply insert a last name into the search box, click on Search button and after a few moments map will be populated. It's possible to search for last names based on distribution throughout Italy or in individual regions by selecting the appropriate option or by clicking on the map. If final letter is accented it should be replaced with unaccented (eg: Abbà Abba). If there's an apostrophe, you should delete all blanks between apostrophe and letters (eg: D' Agostino D'Agostino). If there's a blank you should delete all double blanks between words (es: De Agostini De Agostini).